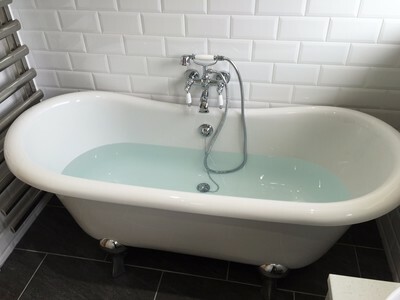 Our showroom is in Billericay and our fitters cover most of Essex for bathroom installation. As our name suggests, we originated in 2001 as a bathroom design and installation company. Our business has evolved since our inception with a showroom opened in Billericay in March 2014. We provide a "one stop shop" for your new bathroom. We will design your new bathroom and you will benefit from our joint 40 years in the bathroom fitting industry. "Very high standard job delivered by very professional, friendly and honest team. The communication was good from the start, I received good advise on materials and design from Graeme, and I could even see the final product in advance via graphic design. Paul and his team did the installation/renovation job, their work was slick and absolute flawless with so much attention to detail, they found solutions to many challenges and they always consulted all possible options with us. No surprises, no hidden charges etc.. they delivered exactly what was agreed from start to finish in all possible fronts. wanting to renovate their bathroom. "Designer Bathrooms Without The Designer Tag"
"A friend of ours had their bathroom refurbished by Ace Bathrooms and we liked what we saw. At the time we were looking to get a new bathroom and so we called Paul to come round talk to us and quote for the work. Paul came round and discussed some ideas and designs and then showed us some of his completed work. Previously, we had seen and asked a number of bathroom contractors to quote but the people who turned up were a bit of a mixed bag; some were just plain odd and you wouldn't want to leave them in your house, others couldn't produce any photos of work actually carried out by them and the remainder were just salesmen. We wanted an experienced craftsman. The clincher for us was that Paul immediately recognised what we wanted and then improved on it. 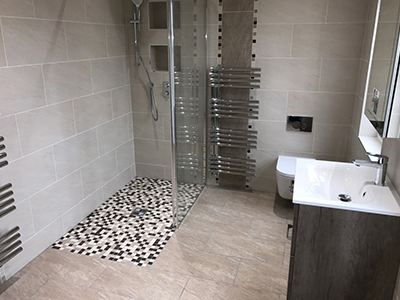 We have small children who can't manage to keep water in a bath, sink or seemingly a toilet even when standing up next to it, so we wanted a fully tiled floor area. Paul went further and suggested that everything be wall hung; the sink, the toilet and the towel radiator so that there was a clear square bathroom floor that could be easily cleaned and mopped corner to corner. Through experience Paul also suggested a number of hidden access panels so that critical plumbing services could be accessed without having to break up any tiles. One clever design idea he came up with was incorporating an access panel into an area of mosaic tiling and then hiding the screw access point to the panel behind a single small mosaic tile which only needs to be "popped out". His experience also shone through when advising on the lighting, mirror and final finishes. Skipping to the end result our bathroom looks fantastic - the finish is of a real high standard and quality and I am pleased to say that the photos have made their way onto the Ace Bathrooms website. We liked the bathroom so much we asked Paul to come back and do a shower room for us. We were asked by Paul to write a short testimony for his website and it is the least we could do to say thank you. 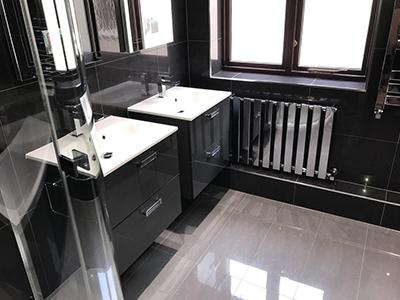 We understand that if you are looking for a new bathroom you need confidence in the person you are about to engage and we hope that this has helped." Andrew and Sarah, Shenfield.